After a weekend of TeamGB Davis Cup action against Australia its back to normal on Monday with a thump! On Saturday we were incredibly lucky to have tickets to see the doubles match of Andy and Jamie Murray vs Lleyton Hewitt and Sam Groth. It was a five set roller-coaster ride of raw nerves which was so much more intense for being in the Emirate stadium and seeing the sheer relief and joy of the GB players and crowd at the final result. 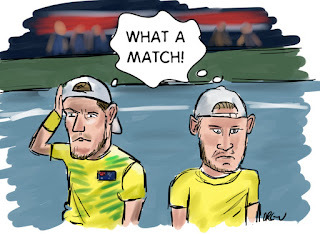 It must rank as one of the best tennis matches I've ever watched and certainly the best doubles match I've witnessed. On the Sunday Andy Murray despite playing the previous two days wrapped up the tie with a reverse singles victory over Tomic and everyone could start thinking about Belgium in November. 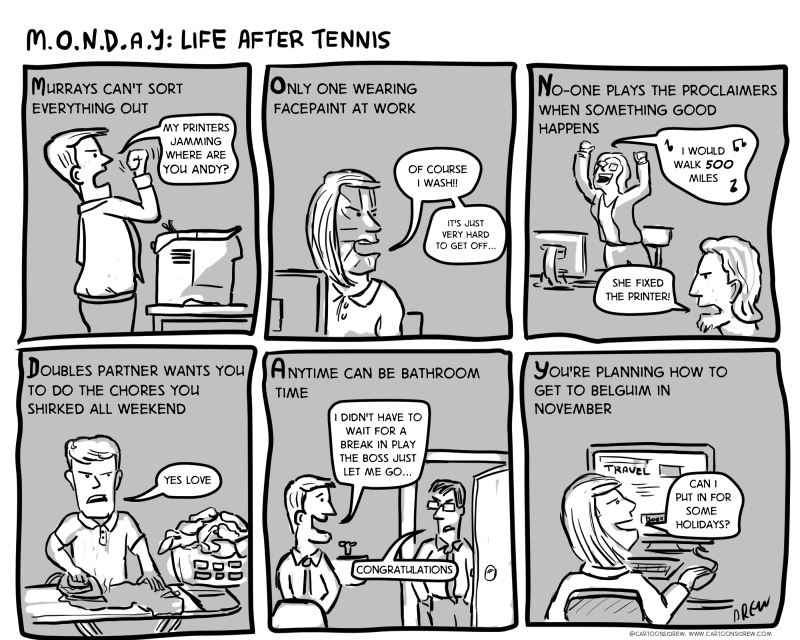 Yet before then we have to come down from our sporting high and work through the intricacies of normal working life. I experienced it before in Glasgow after the Commonwealth games when the closing ceremony finished and the Commonwealth banners, cars and statues disappeared (some stolen) it felt like the day after the Christmas holidays when you know its January and its a long long time til Santa visits again. Here is the cartoon I did last July called Commonwealth Legacies. ps. This was more first live Tennis event (I've been to plenty other sports) and an hour or so in I felt very middle class tut-tutting at the inconsiderate types shuffling around when it wasn't the appropriate time to do so (and in Andy Murray's eye line as well!). 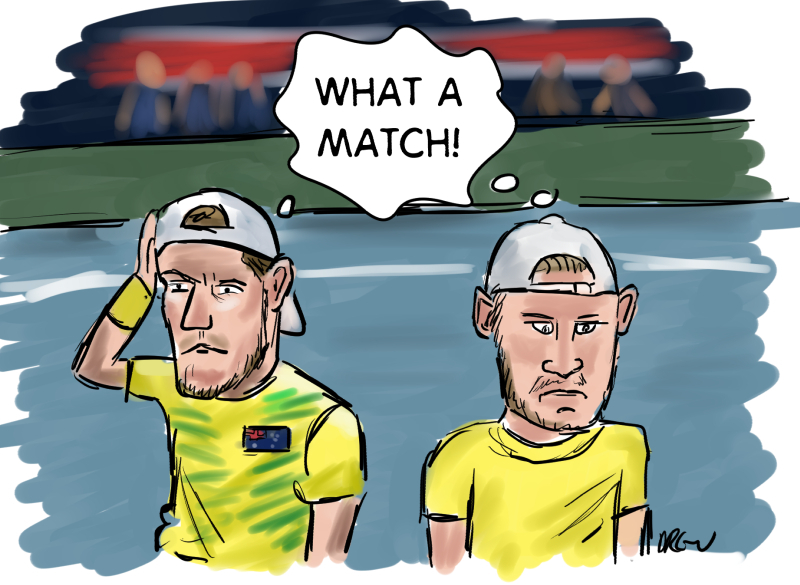 I gave myself a challenge to digitally draw/paint all the members of the GB Davis Cup team ahead of the Semi Final vs Australia in my home city of Glasgow. 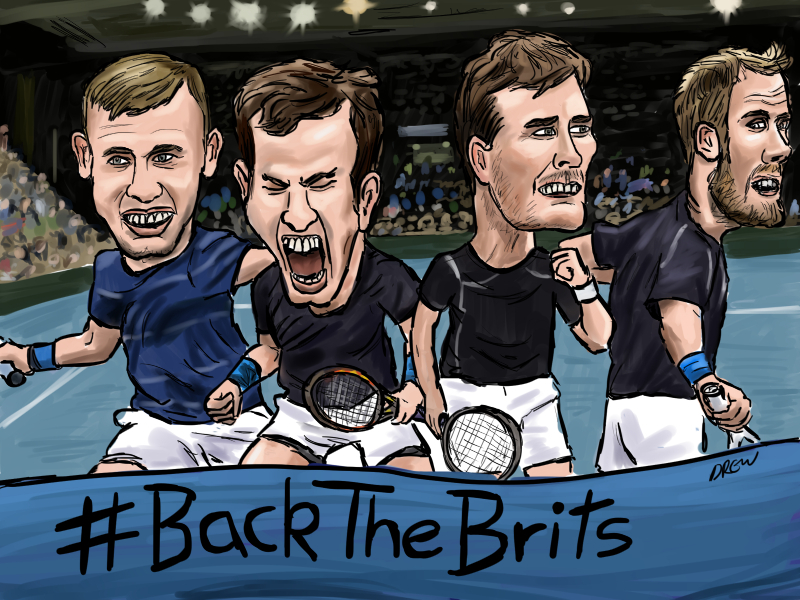 It isn't the first time I've drawn Andy Murray (see here from 2013) but its the first time I've attempted Jamie Murray, Dom Inglot and Dan Evans the other GB players. Watched today's September Apple special event streamed from San Francisco. 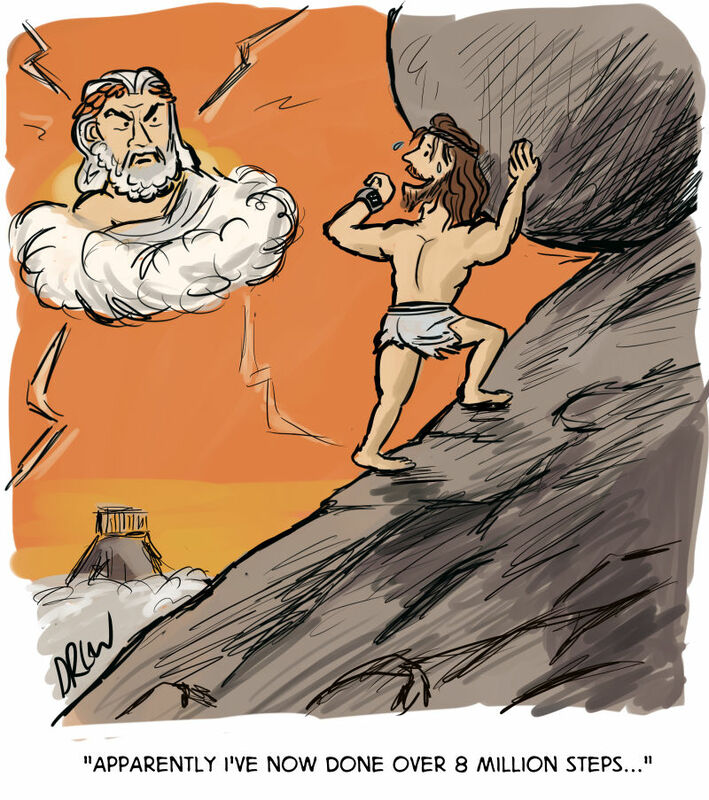 Afterwards I drew this cartoon about the new Apple TV with Siri support and apps to with some suggestions from my wife. Microsoft are going to be miffed if iPad Pro is a success and Surface bombs given they had external keyboards, pressure sensitive stylus and big price tag first. Apple Pencil could be good or could be like all those other stylus I have thought were going to be great that ended up in my drawer unused. Wacom may be worried this is muscling in on their Cintiq territory but desktop software is still better than what iOS apps offer at the moment IMHO. Apple TV is trying to become a console with its app store offering games. Talking to your TV is going to feel stupid for a while and chaotic when the whole family can do it. If 3D touch on Apple Phone 6S is revolutionary Android will soon do something similar for less. Also everyone is going to call it Force Touch because its way funnier and you can use it for Star Wars references. Nobody needs an emergency selfie unless they are being murdered and want to be avenged. I'm glad U2 didn't show up although the audience didn't look like they were the sort to get up and boogie to a rock band anyway. Jonathan Ive thinks everything Apple produces is revolutionary. Friday say the release of the Sphero BB-8 droid toy to coincide with the new Star Wars film coming at Christmas. Many boys, men and men-boys will be looking for this awesome robo-gadget in their stocking. ps. If anyone wants to send me one for free for evaluation or to make an unboxing Youtube video that would be fine I can guarantee at least 10 views (I think). 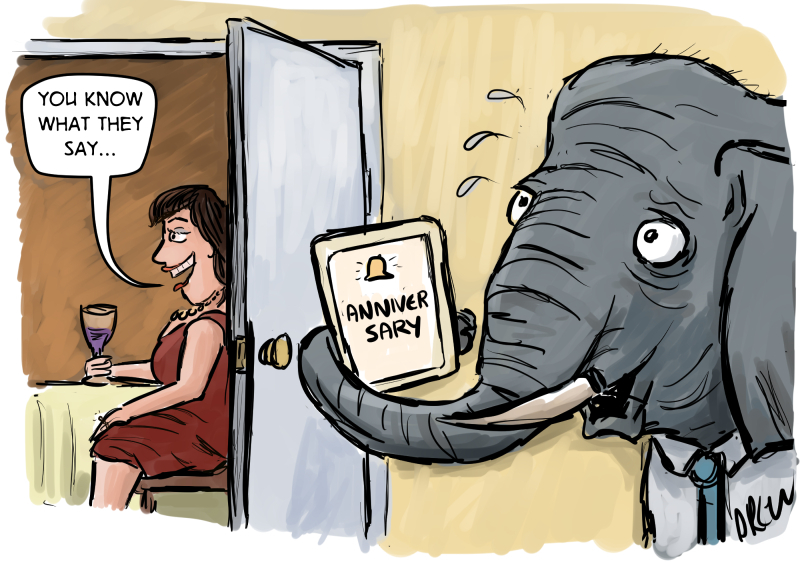 Cartoons about a well know saying "An elephant never forgets". Elephants do have impressive memory particularly the matriarchs who can recall old friends and enemies as well as places they have been. 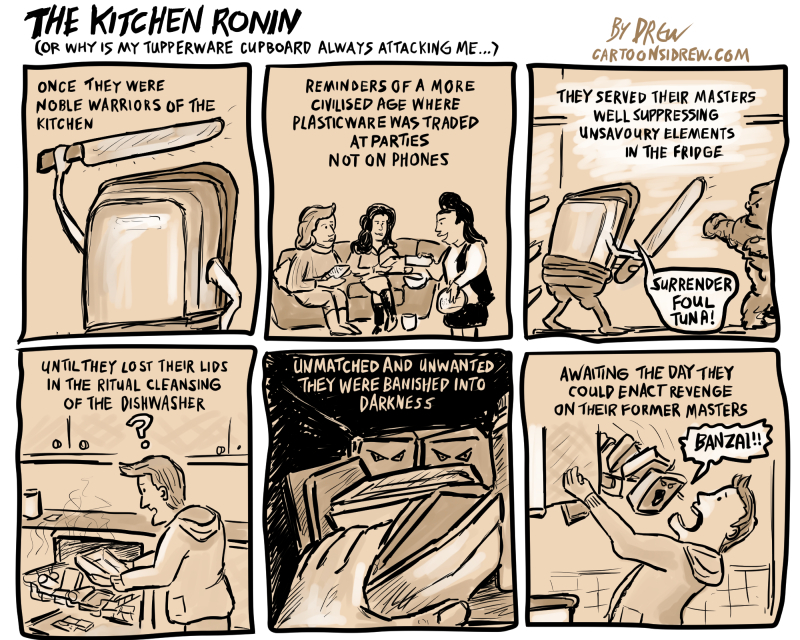 This is the sort of cartoon strip you draw when you are reading James Clavell's Shogun while wondering about Tupperware.